Beautiful shades of greens and blues grace this charming Eleanor Collection Biggie. Layered embellishments and lots of details make this versatile collection one you'll reach for again and again. Contains 5 upper case alphabets, dozens of word art pieces, and lots of unseen pieces. 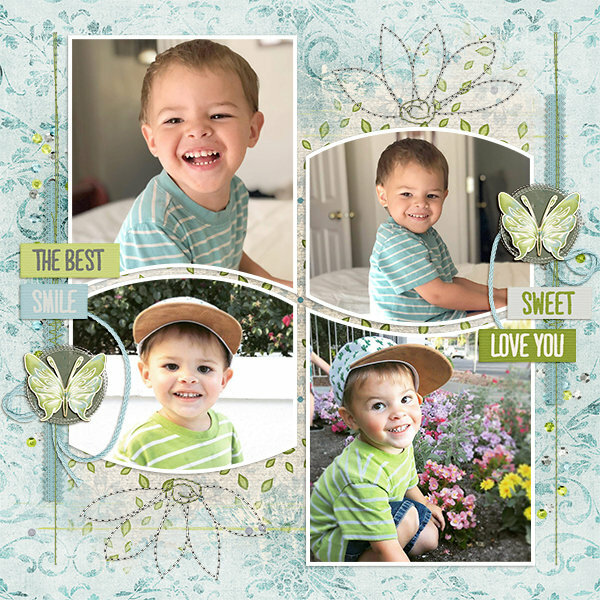 Coordinating perfectly with the Eleanor Collection Biggie, this full alphabet with upper and lower case letters, numbers and some punctuation is a versatile and neutral addition to your scrapbook stash. Beautiful shades of greens and blues will coordinate with almost any photo you have, and go beautifully with the Eleanor Collection Biggie. Beautiful shades of greens and blues grace these beautiful semi-solid papers in the Eleanor Semi Solid Paper Mini.